The first 100 days of a new presidency are pivotal ones. It is during this time that the administration’s priorities take the forefront and campaign rhetoric is separated from the emerging policy platforms. By 100 days, the reality of the job starts to sink in. The president and his staff has a greater understanding of the limitations and expectations of the position, both domestically and globally. Foreign policy goals are particularly malleable during this period of transition since most presidents have little practical experience in foreign affairs or familiarity with the complex global arena. For President Trump, this is no different, as can be seen in his shifting attitudes and actions towards China. After taking office, Trump ultimately decided not to label China a currency manipulator. According to the president, this change in policy was because China was no longer manipulating its currency and because he was prioritizing talks with China on the North Korea issue. When questioned further about this decision in a recent interview, President Trump said China’s currency manipulation stopped as soon as he got elected. While this reasoning might not hold much weight, especially since the International Monetary Fund concluded that Chinese currency was no longer undervalued all the way back in 2015, the North Korea issue likely did play a large role in this decision. This was not the only shift President Trump made since coming into office. While president-elect, Trump took a phone call with Taiwan’s leader Tsai Ing-wen, an unprecedented acknowledgement of the autonomy of Taiwan, which is claimed by the People’s Republic of China and is not officially recognized by the United States as its own country. He then said in an interview that he did not see why the U.S. had be bound by the One-China Policy, which acknowledges the Chinese stance that there is only one China, encompassing both mainland China and Taiwan. Soon after taking office, however, Trump had a phone call with Chinese President Xi Jinping during which he agreed to honor the One-China Policy. President Trump’s rhetoric and attitude towards China also changed. 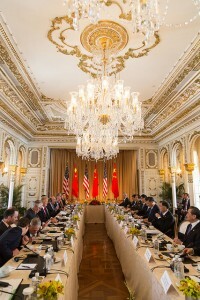 The informal and friendly atmosphere of the Trump-Xi summit at Mar-a-Lago stood in stark contrast to campaign vitriol painting China as the enemy. President Trump’s grandchildren even sang a Chinese folksong for the visiting delegation. This new willingness by President Trump to engage with China after he was elected follows a long tradition of new presidents moderating their China stance once taking office. China is a common campaign target, but, once the realities of China’s global importance is better understood and other foreign policy priorities take precedence, the administration’s stance often changes. For Trump, the key factor marking his change was North Korea. So, what happens if China fails this test? China is not as willing undergo any means to stop North Korea as the U.S. is. After all, as North Korea’s neighbor, China will have to deal with the consequences or potential fallout of any actions taken. Furthermore, the amount of power China actually has over North Korea is questionable. For instance, the leaders of the two countries have never even met and North Korea has frequently acted against the advice and admonishment of China in recent years. If the North Korea problem is not solved quickly and to President Trump’s satisfaction, or if China does not play the part President Trump believes it should, will this new friendship come to an end? Will China’s presumed failure be used as the reasoning behind even harsher policies towards China than the ones originally proposed by Trump during his campaign? If the current U.S.-China relationship truly hinges on this one issue area, then it is left with an uncertain future. Hopefully, cooperation on North Korea will lead to cooperation in other areas and a stronger, multi-faceted, and more resilient relationship will emerge. Right now, there is still a large level of uncertainty over how the overall U.S.-China relationship will develop under the Trump administration. The Mar-a-Lago meeting was noticeably short on substance. It did, however, end with an accepted invitation for Trump to visit China. When that proposed meeting takes place, we will likely be given a much clearer picture of the progress of this vital bilateral relationship.